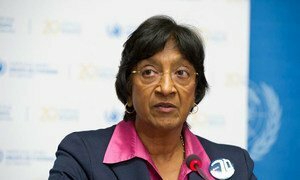 A group of independent United Nations human rights experts has asked the Venezuelan Government for prompt clarification of allegations of arbitrary detention and excessive use of force and violence against protesters, journalists and media workers during recent protests. “The recent violence amid protests in Venezuela need to be urgently and thoroughly investigated, and perpetrators must be held accountable,” the experts stressed in a news release. They also expressed their shock at the reported deaths of at least 17 persons during the demonstrations. The experts – all of whom are appointed by, and report to, the UN Human Rights Council – also drew attention to reports of violence against journalists and media workers monitoring and reporting on demonstrations in Venezuela. The experts, who acknowledged the call for a national dialogue made by President Nicolás Maduro, emphasized the importance of fully guaranteeing the rights to freedom of peaceful assembly, association, opinion and expression in this critical context. “The reconciliatory dialogue that is so deeply needed in Venezuela is not going to take place if political leaders, students, media groups and journalists are harassed and intimidated by the authorities,” they stated. In addition, they said they stand ready to travel to the country and engage in a constructive dialogue with all parties, and called on the Government to respond positively to pending requests to visit. Independent experts or special rapporteurs are appointed by the Geneva-based Council to examine and report back on a country situation or a specific human rights theme. The positions are honorary and the experts are not UN staff, nor are they paid for their work. The experts speaking out on Venezuela are Frank La Rue, Special Rapporteur on the promotion and protection of the right to freedom of opinion and expression; Maina Kiai, Special Rapporteur on the rights to freedom of peaceful assembly and of association; Mads Andenas, Chair-Rapporteur of the Working Group on arbitrary detention; Juan Méndez, Special Rapporteur on torture and other cruel, inhuman or degrading treatment or punishment; Christof Heyns, Special Rapporteur on extrajudicial, summary or arbitrary executions; and Margaret Sekaggya, Special Rapporteur on the situation of human rights defenders.